At Grab, safety is our utmost priority. That is why we’re always on the lookout to improve our products and services in ways that will maintain the safety of both our Partners and passengers. With the introduction of the Partner Selfie Verification feature, we aim to provide an extra layer of protection in ensuring that your Grab Driver account remains secure. Additionally, passengers can ride with added peace of mind knowing that their driver has been verified. The Partner Selfie Verification feature will be available to all GrabCar Driver-Partners in Singapore on 26 June 2018. Approximately twice a day, you may be prompted to verify your identity when you toggle on your job availability. Fret not, you do not have to do the Selfie Verification while in the middle of a job. IMPORTANT: Please ensure that you have a working front-facing camera and sufficient lighting when performing a Selfie Verification. If you are unable to verify your identity, you might not be able to receive any jobs. Step 1: Ensure that your vehicle is stationary and parked in a safe location. Step 2: Tap “Start Verification” to begin the verification process. Step 3: Follow the instructions on your phone screen to do a selfie. Step 4: Complete the verification process and continue receiving jobs. For Partners on iOS, Selfie Verification may trigger when you tap on the Power button. Q. When will the Selfie Verification feature roll out? A. The feature will be enabled for all GrabCar Partners by 26 June 2018. You will receive an SMS notification from Grab just before it is enabled for your Grab Driver app. .
Q. Which Partners will the Selfie Verification feature be enabled for? A. 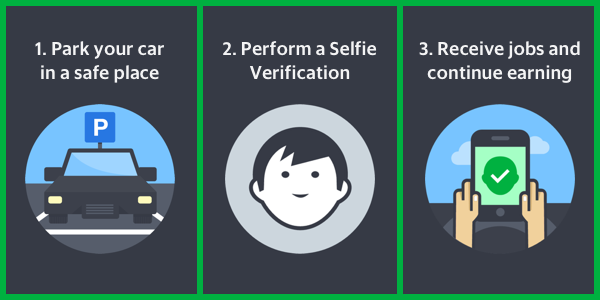 The Selfie Verification feature will only be enabled for GrabCar Partners. Q. How often will I need to do a Selfie Verification? A. You will be prompted to do a Selfie Verification approximately 2 times a day, when you toggle on your job availability. Q. Do I need to do a Selfie Verification every time I toggle my availability? A. No, you will not be asked to do a Selfie Verification every time you toggle your availability. You will only be prompted to do a Selfie Verification approximately 2 times a day. Q. I’m currently in the middle of a job. When I try to toggle myself as available, there’s a message saying I need to verify my identity first. What should I do? A. If this happens, please toggle your availability only after the job ends. This will trigger the Selfie Verification process. Ensure you’re parked in a safe location before verifying your identity. Q. What happens if I choose not to do the Selfie Verification? A. If you do not verify your identity, you might not be able to toggle on your availability and receive jobs. Q. What should I do if my face does not get detected? A. Please ensure that your face is correctly aligned with your phone camera and that you have sufficient lighting. Follow the instructions on your phone screen. Also, your face should be unobstructed (i.e. no cap or sunglasses). If the problem persists, please contact Grab Support for assistance. Q. What happens if my Selfie Verification fails after several attempts? A. Your Grab Driver account may be locked after several failed verification attempts. If you get locked out, please contact Grab Support for assistance. Q. Why am I being asked to take a new selfie photo? A. You might be asked to take a new photo if your current photo with Grab is not clear enough. Please ensure that your face correctly aligned with your phone camera and that you have sufficient lighting. Follow the instructions on your phone screen. Also, your face should be unobstructed (i.e. no cap or sunglasses).